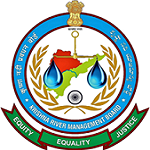 Krishna Basin extends over an area of 258,948 square kilometres (99,980 sq mi) which is nearly 8% of the total geographical area of the country. This large basin lies in the states of Karnataka (113,271 km2), Telangana, Andhra Pradesh (76,252 km2) and Maharashtra (69,425 km2). The Krishna river rises in the Western Ghats, at an elevation of about 1337 m just north of Mahabaleshwar, about 64 km from the Arabian Sea. It flows for about 1400 km and outfalls into the Bay of Bengal. The principal tributaries joining Krishna are the Ghataprabha, the Malaprabha, the Bhima, the Tungabhadra and the Musi. Most of this basin comprises rolling and undulating country, except for the western border, which is formed by an unbroken line of the Western Ghats. The important soil types found in the basin are black soils, red soils, laterite and lateritic soils, alluvium, mixed soils, red and black soils and saline and alkaline soils. An average annual surface water potential of 78.1 km3 has been assessed in this basin. Out of this, 58.0 km3 is utilisable water. Culturable area in the basin is about 203,000 km2, which is 10.4% of the total culturable area of the country. Mullayanagiri peak, in Karnataka, is the highest point (1,930 m) of the Krishna basin.